PLEASE NOTE - During FUCHS corporate re-branding, some stock may include a mix of old and new styles depending on current levels. PLEASE NOTE - During Fuchs corporate re-branding, some polo orders may include a mix of old and new style polos depending on old stock status. Great for the workshop or for casual wear. PLEASE NOTE - During Fuchs corporate re-branding, some shirt orders may include a mix of old and new style polos depending on old stock status. Fleece lined inside for extra warmth and comfort. 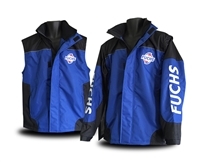 2 in 1 FUCHS Racing Jacket & Vest.